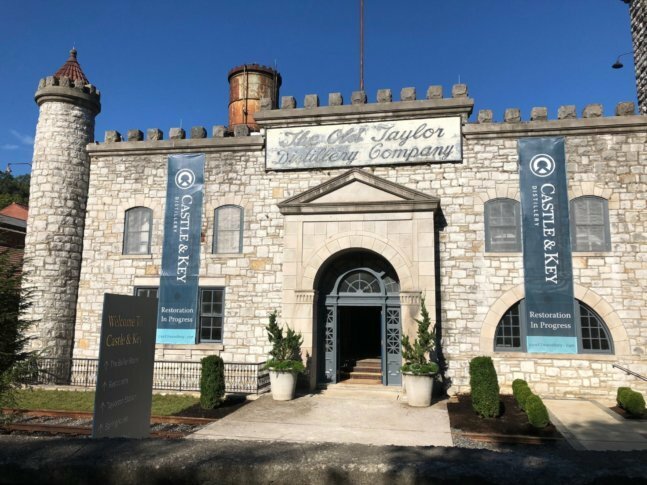 Two newcomers to the whiskey business have resurrected the Old Taylor distillery,which is housed in a picturesque castle in Millville, Kentucky. And along with bourbon and rye, they hope once again to generate tourism. MILLVILLE, Ky. (AP) — The whiskey quit flowing decades ago from a landmark Kentucky distillery housed in a picturesque castle. Nearly a half-century of neglect reduced the one-time tourist draw to a decaying relic. Now, two newcomers to the whiskey business have resurrected the Old Taylor distillery and renamed it. And along with bourbon and rye, they hope once again to generate tourism. Will Arvin and Wes Murry saw potential where others perceived only blight. In the past four years they’ve spent millions to restore the old glory of the castle-like entrance, sunken garden and colonnaded springhouse. Renamed Castle & Key Distillery, the facility resumed spirits production in late 2016 — the first year whiskey was produced there since the distillery shuttered in 1972. On Wednesday, the grounds reopened to visitors. Arvin and Murry are following in the footsteps of the distillery’s founder, Col. E.H. Taylor. A bourbon giant of his time, he built the Old Taylor distillery in the late 1880s and made it a forerunner of today’s bourbon tourism business. Ownership eventually passed to National Distillers, and production ended during a lean time for bourbon producers. Now bourbon sales are booming again, and the new owners are preparing bourbon and rye whiskey to hit the market under the Castle & Key label. The brown spirits are still maturing in barrels nestled in the distillery’s warehouses. Master distiller Marianne Eaves hopes rye can make its debut in about a year, and says the brand’s bourbon could be ready in 2021. “We’re letting flavor drive the decision on the release date,” she said. Murry said they hope to turn a marginal profit within a couple of years. In the meantime, the owners have found other ways to generate income. The brand’s vodka and gin reached store shelves in April. The distillery also produces bourbon and rye on contract for several corporate customers. Tourism should help the bottom line, especially if the iconic facility joins the Kentucky Bourbon Trail. Kentucky Distillers’ Association President Eric Gregory is among those predicting tourism success for Castle & Key. The central Kentucky distillery between Frankfort and Versailles sits a few miles from the Woodford Reserve and Buffalo Trace distilleries. “It will be one of the most visited bourbon tourism sites in Kentucky — quickly,” Gregory said. Enter Arvin and Murry. Looking to become a distillery owner and tap into bourbon’s resurgence, Arvin discovered the Old Taylor site on the internet. A mutual friend connected him with Murry, 40, who was looking for an entrepreneurial venture. They paid about $950,000 for the distillery in 2014. Restoring it took longer and cost more than expected, and it meant career changes. Arvin, 51, left a law career behind; Murry worked in finance. The enormity of the renovation would have driven many to drink. Most of the windows were boarded up. One storage warehouse had collapsed. Roofs were failing. The grounds were a jungle of weeds. Eaves, 31, was a rising star during her time at Brown-Forman Corp., whose products include Jack Daniel’s Tennessee Whiskey and Woodford Reserve bourbon. She was drawn by the Old Taylor site and the new owners’ ambitious plans to revive it. Creating the Castle & Key spirits lineup as master distiller seemed a “once in a lifetime opportunity” when she signed on in early 2015. Soon, though, the size of the challenge became apparent — and that was long before whiskey was mentioned as a tariff target in an international trade war. Now, the distillery hums with activity seven days a week. The workforce is 60 and growing. The grounds are manicured, thanks to renowned Kentucky landscaper Jon Carloftis, and a quarter-mile botanical walking trail beckons. Gregory said the hidden treasures among Kentucky’s abandoned distilleries “are getting very few and far between.” But as Castle & Key achieves more milestones, he thinks some of the prospective buyers who passed up the chance might regret their decision. “They’re probably kicking themselves already,” he said.